Some photos that does not yet fit any of the cathegories. 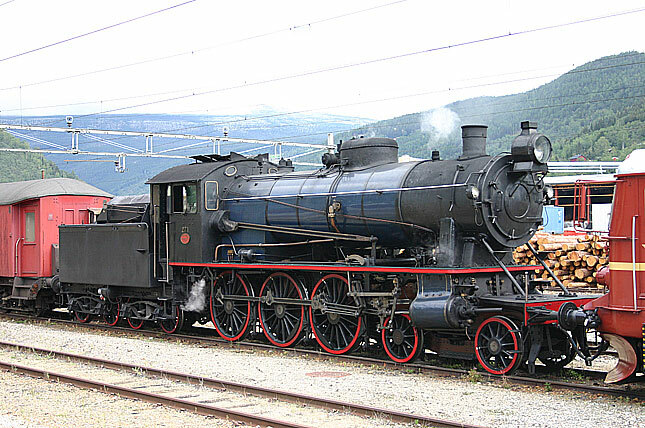 The ten wheelers of Type 30 class were constructed between 1914 and 1939. 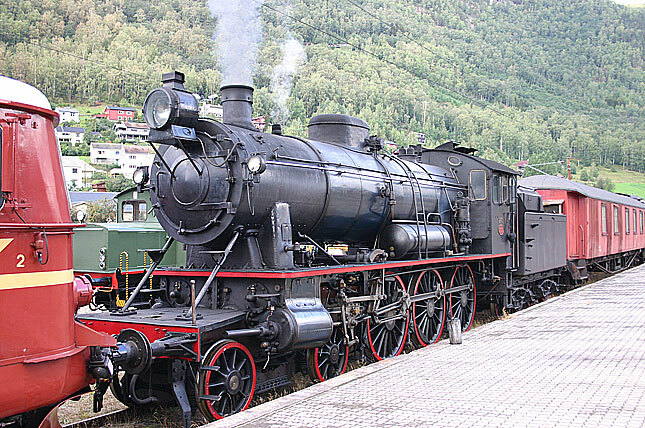 One of the engines survived and during the summers handles with matching wooden passanger cars the scenic run from åndalsnes and bjorli during the summer months. 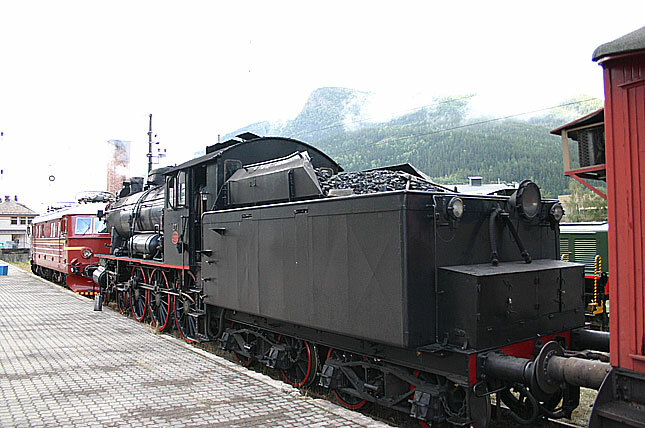 The consist now owned by NJM, was caught in Otta along with E11.2107 which pulled the consist home to the south. Otta 29th and 30th August 2006. 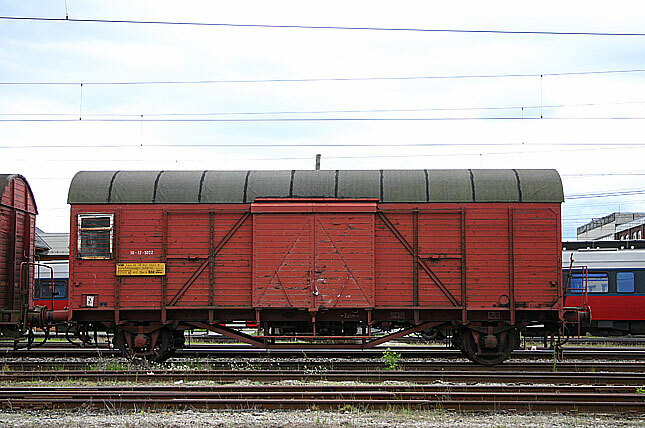 Unfortunatly there seem to be a problem with one of the bogies of the cars, I learned a leaking break line. 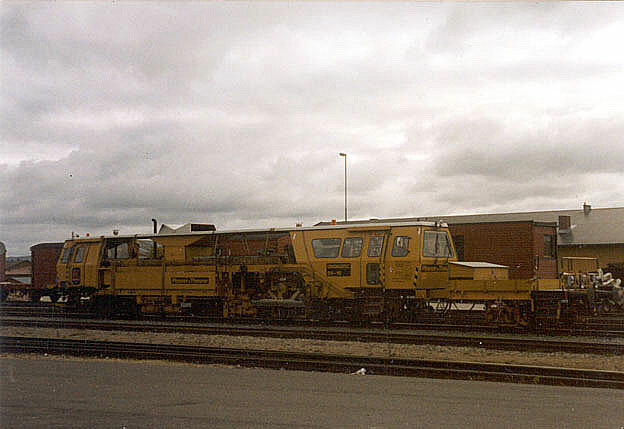 But then again if the plans were carried out i would not been able to take these photos. 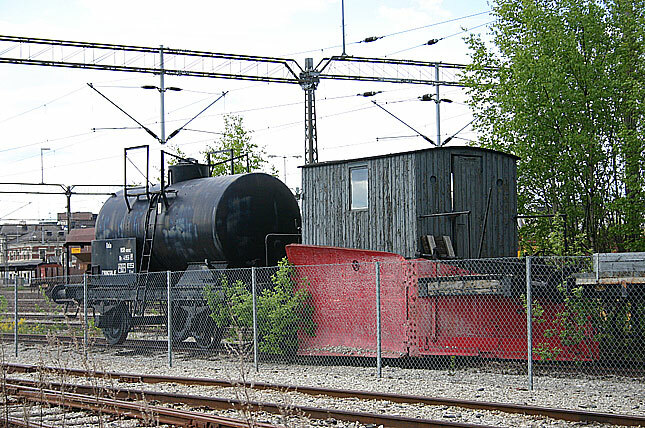 The oldest railway museum in Scandinavia is located in Hamar, where this narrow gauge tankengine and the restored cars are used to haul visitors through the rather limited area. 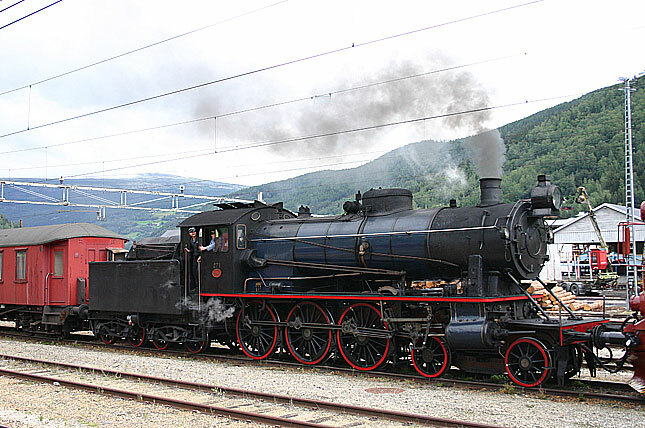 Right now this is the only Norwegian steam engine that I got a decent shot of, so this is the reason that it is on "odd" section. No I have so far no plans to turn this site to a site of light rail but I could not pass this up while I sat caught during a commuter rush hour in Trondheim. 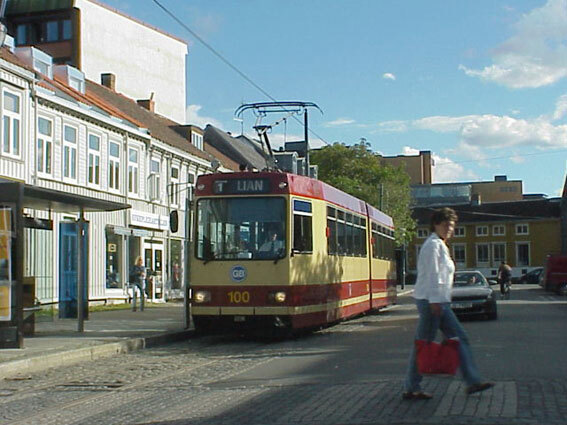 The line is now the last remaining tram in town, much becuse the line needs to deal with a respecting grades along the line. 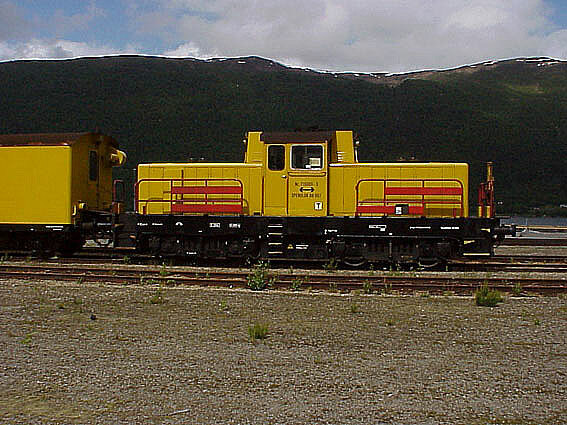 This engine is one of the interesting engines of the preserved 1000mm gauge Thamshavn line. 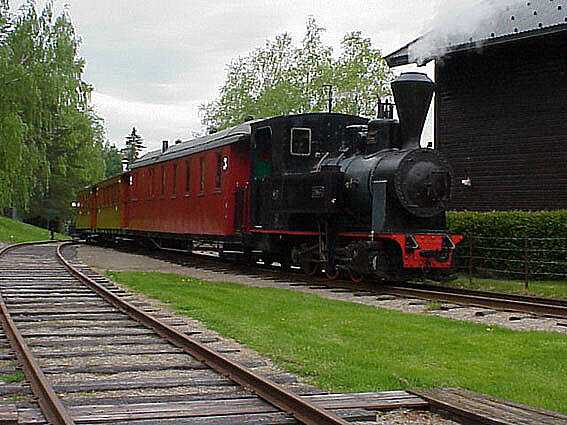 the line took advantage of the electric powerplant s in the area and early electrified the entire line in the early 20th century. 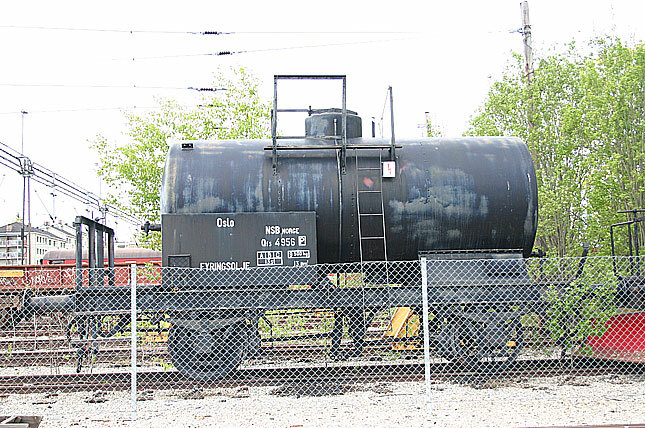 During the WWII the Germans was forced to send a powerful 2-10-2 tank to provide extra muscle when the line was target for sabotage, which resulted in the electric operation came to halt. The caternary service acars have become self running motorcars, now custom built. 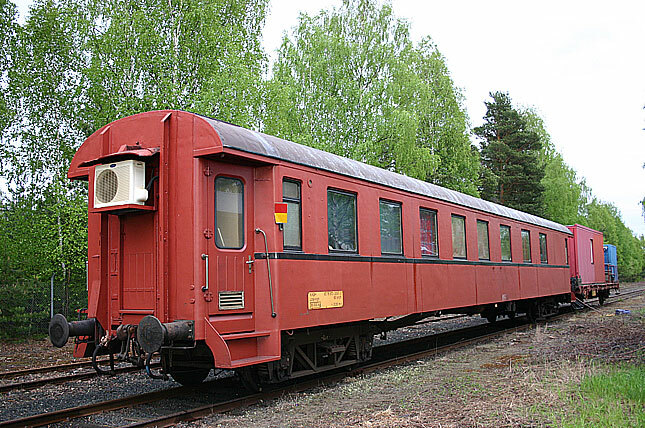 Previously modified from old cars and older DMU.s. 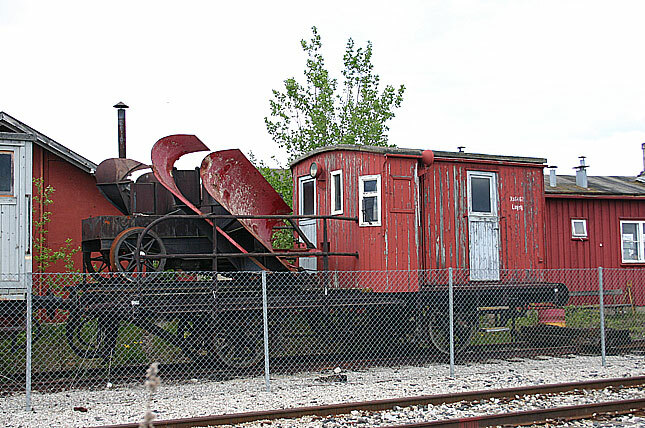 This later construction sports a hydralic work platform. Otta 29th August 2006. To see this small and cute is a favorite for kids but these were very much needed equipment on their hey days. 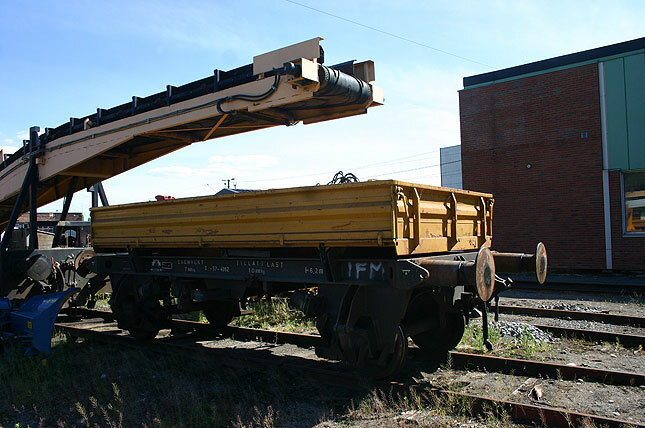 For track inspections and to haul workers to a work site. 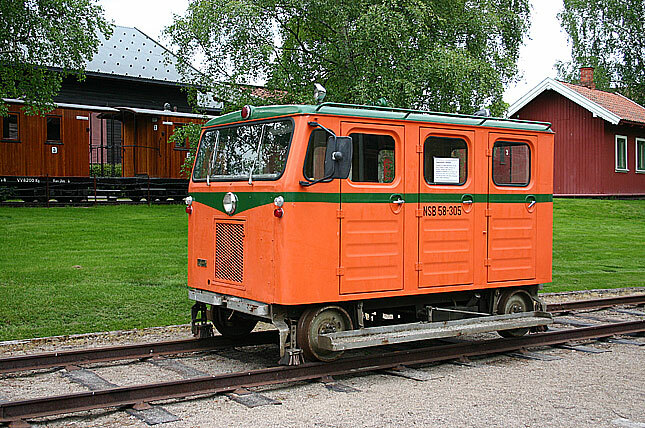 In Sweden one manufactor specialized itself in building anything from speedsters like this to larger passanger carring railcars. 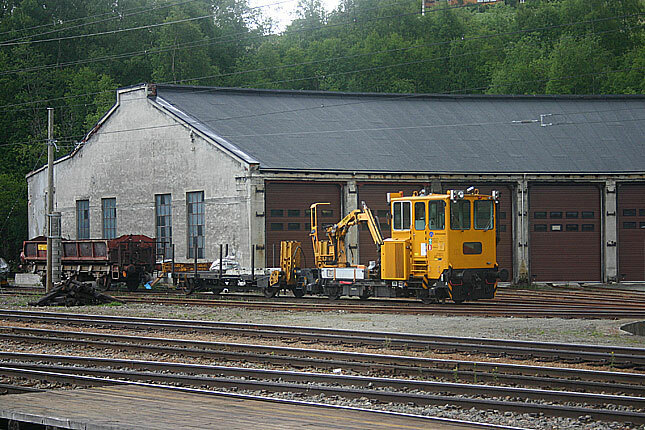 One of the speedsters delivered to Norway, and one of them is preserved at the nation rail museum in Hamar. 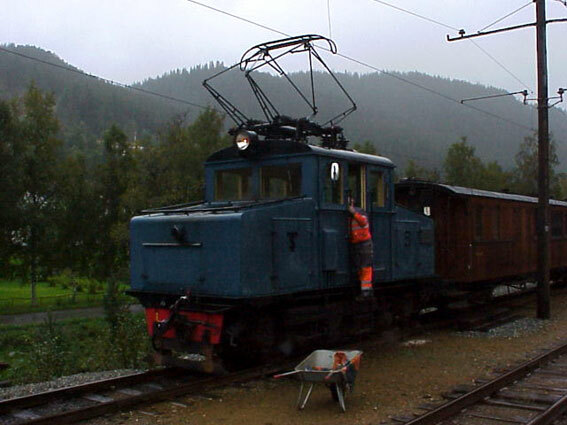 So if you found that unit in Dombås as easy, how about this shop switcher at Marieborg in Trondheim? 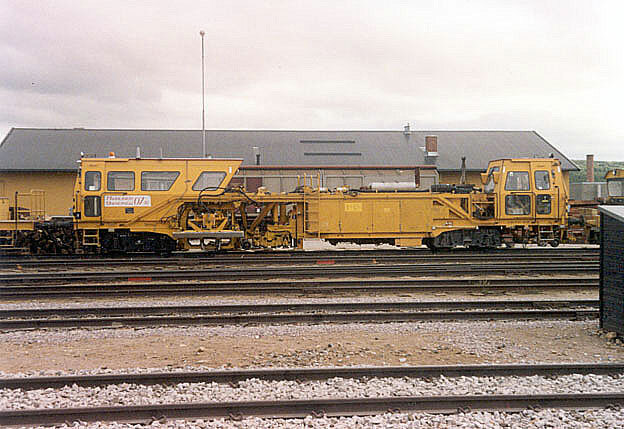 With rubber tires it will be able to leave tracks and parked out of the way . 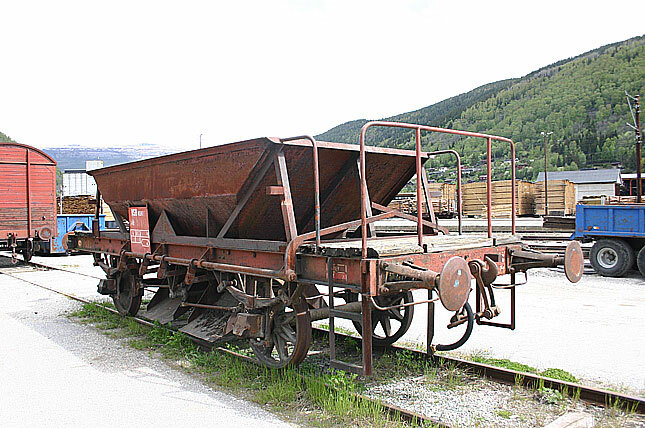 A MoW vehicle at the east track of the yard in Dombås. 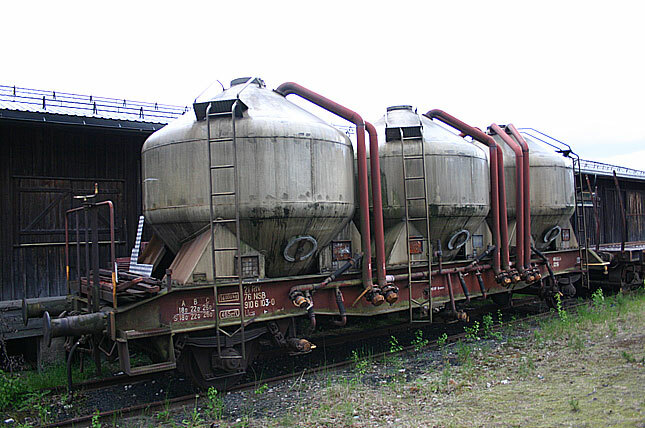 The ballast regulators has developed a lot since they were introduced. Now adays they can do a lot more and precise. 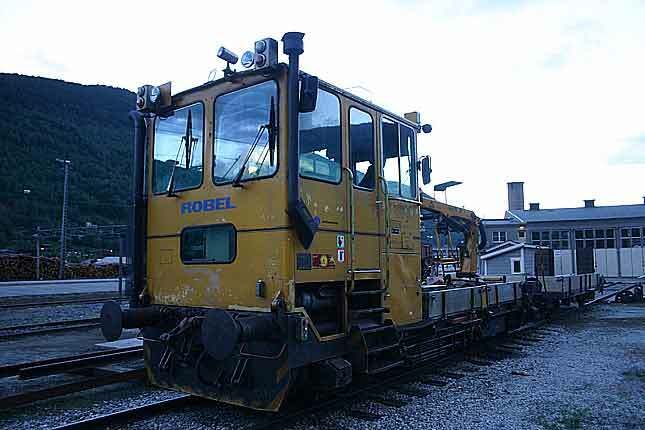 By the way a model of these modern equipment are made by Kibri. 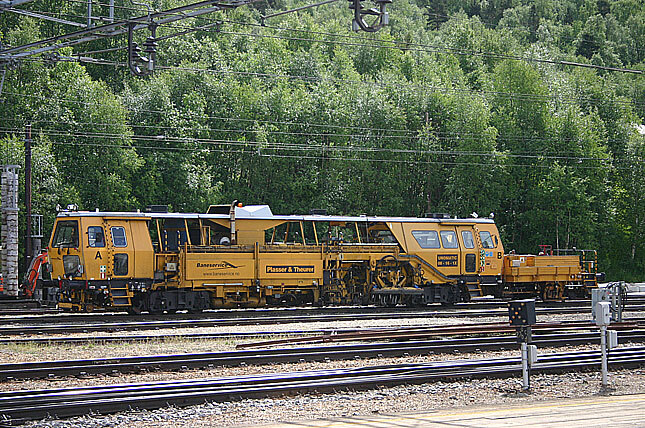 Another big yellow machine in Elverum. 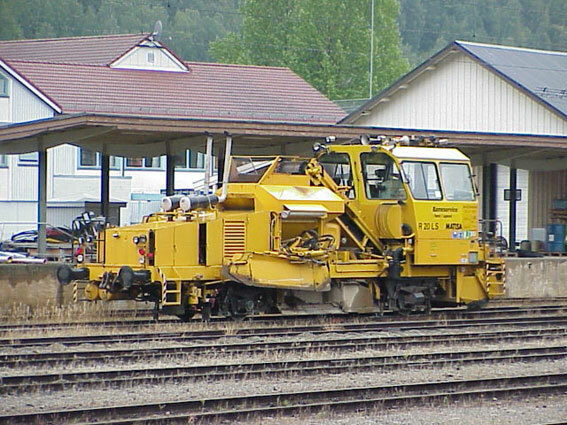 My guess is that this machine cleans and burns all the weeds on the mainline. 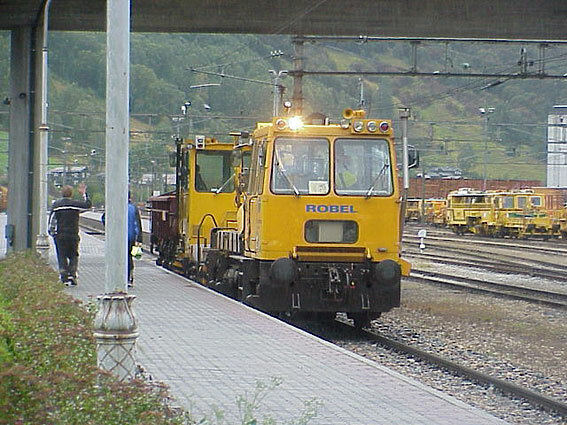 A Robel at Hamar waiting for the next asignment. 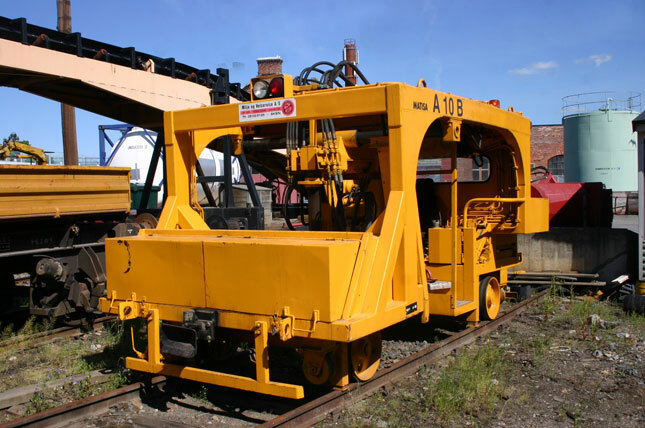 MoW equipment are of varoius types, some interesting and some...less interesting. 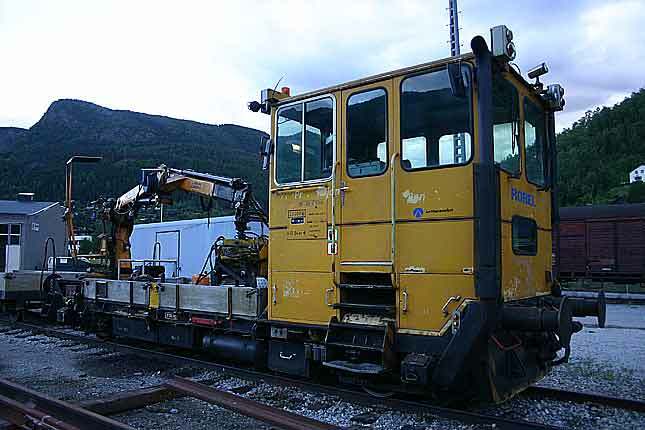 One of the more intersting is this Robel made railtruck with the front end loader loaded on the trailer, photo from Eina in 2002. 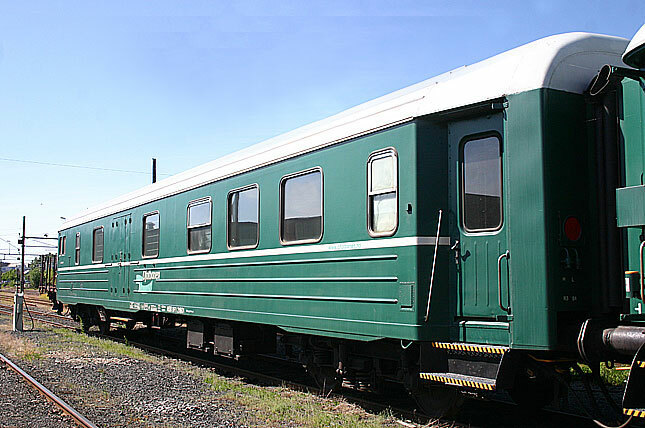 When I went through these pictures it appears that this Robel rail car seem to have taken pretty much the same excursion as I did. 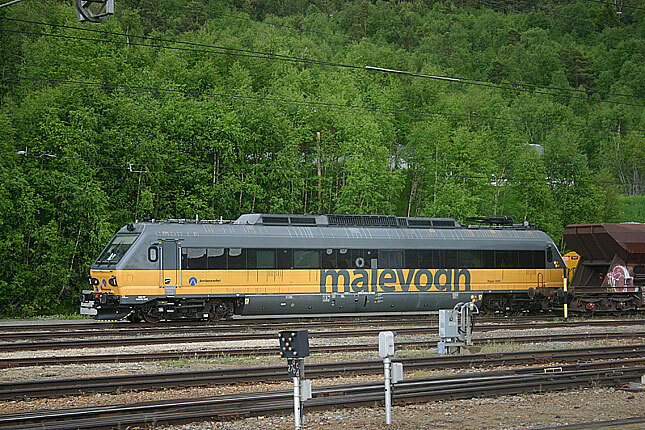 First, I shot it in Trondheim first of June 2004, and following day, it sat at the roundhouse in Åndalsnes and later in the evening it departed as scheduled! 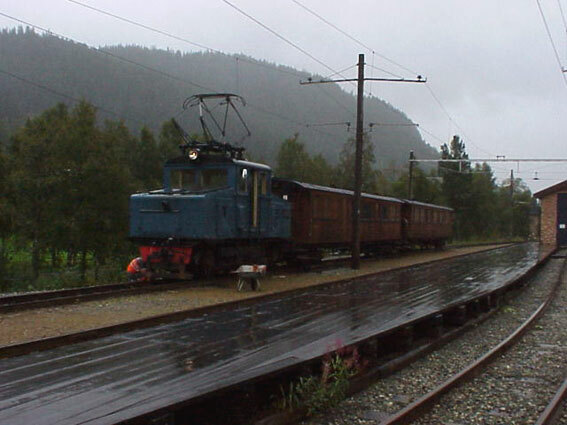 train for Dombås. 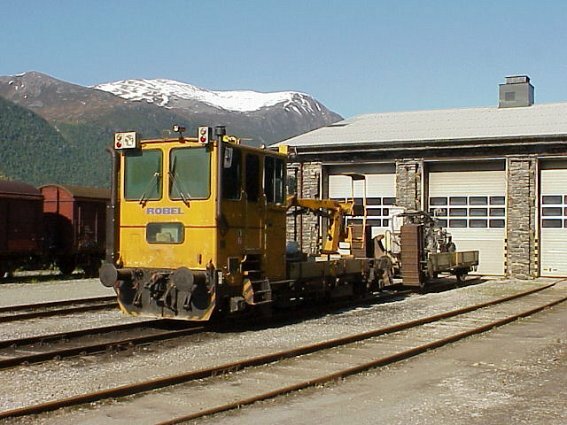 It seems that the round house area in Oppdal is a center for the MoW duties on the lines climb over the Dovre mountains. 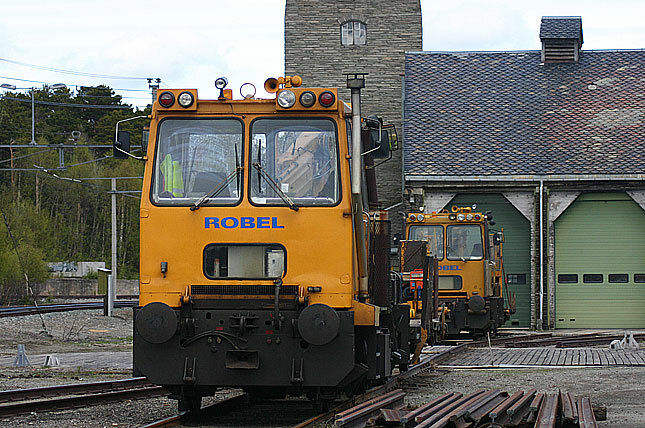 Here we see three shots of Robels sitting idle in 7th of June 2005 in Oppdal. 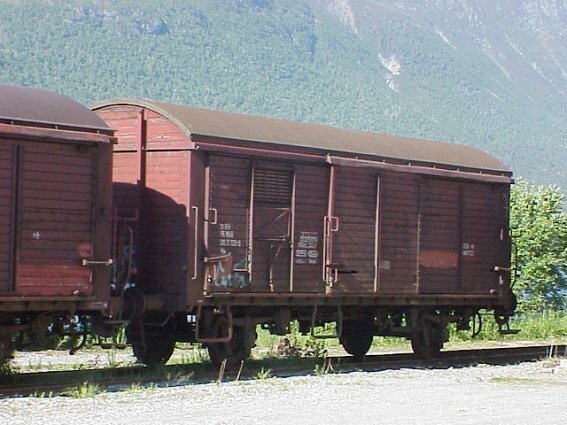 These Robels seem to be found everywhere and seems to be handy to haul a section crew and tools and some tools and car or two to the sites. 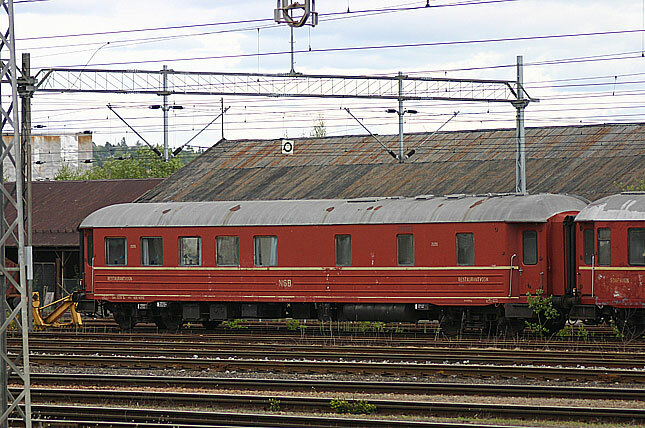 Hamar 30/5 2006. 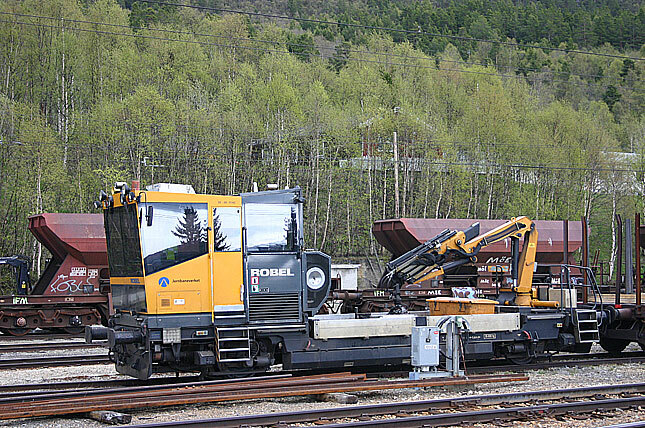 As the large number of MoW equipment has been gathered in Dombås there is not a hard question that either Raumaline of the main line over the Dovre mountains will get some extra atention and tie replacement. 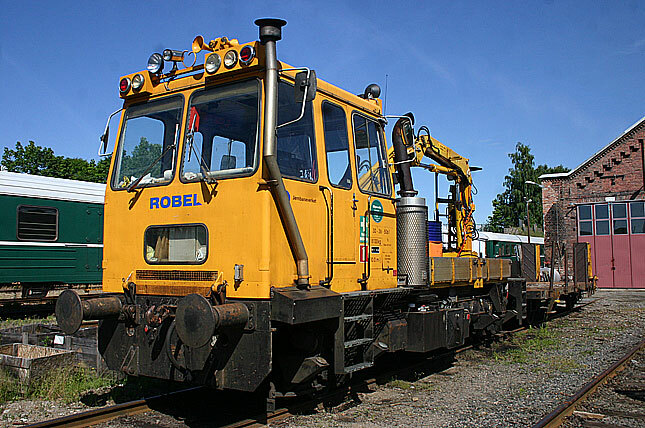 These Robel rail cars, as the one seen here are handy in these operations. 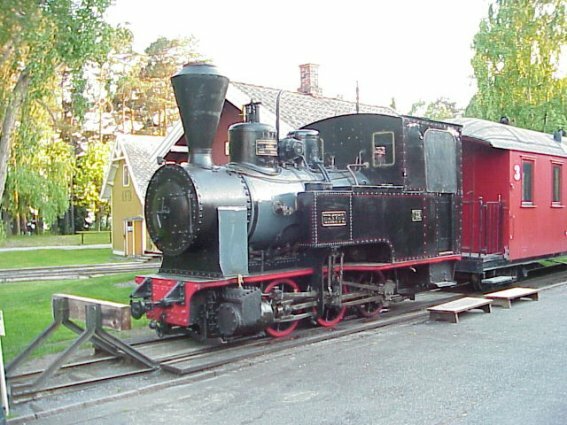 31/5 2006 Dombås. 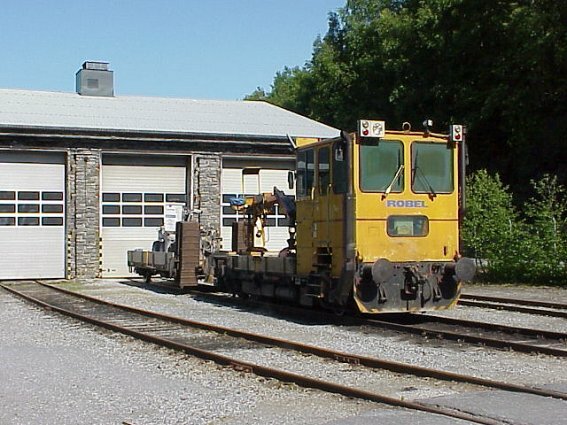 At Elverums sizely yard sees a small headquarters for the MoW on the line. 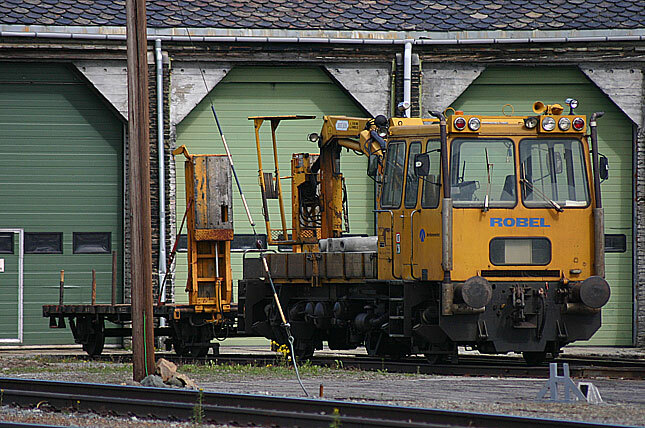 I could at this day spot 10 gracel cars, this Robel and an ex NSB B1 crew dormitory car sitting in various sidings on the yard. 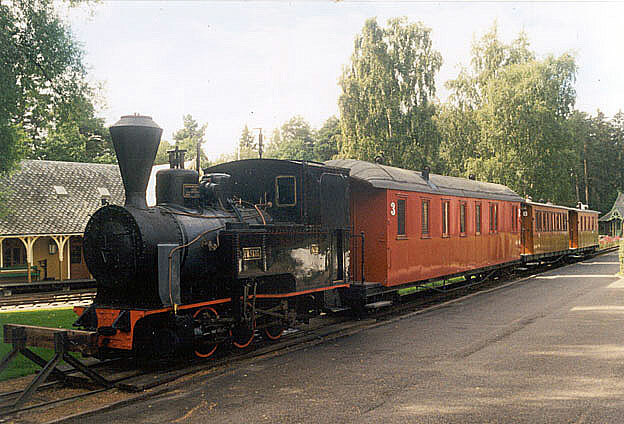 2/6 2006 Elverum. 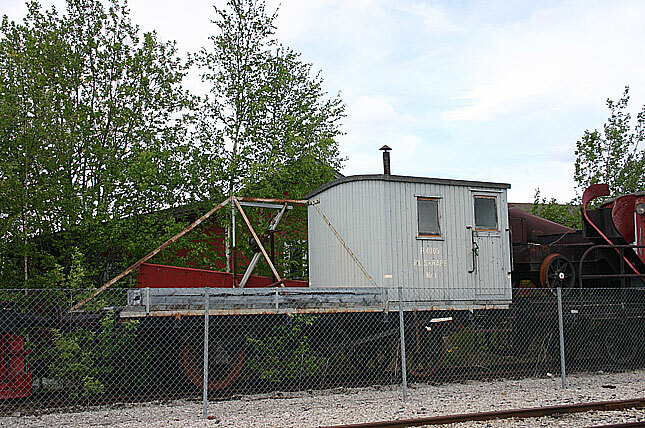 At the round house end of the yard it is a common thing to see MoW-equipment as this Robel with a small trailer. 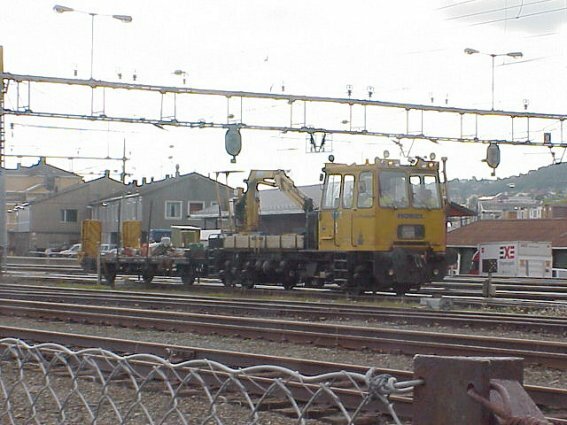 Catenary construction car at Hamar 26th of Septemrber 2004. 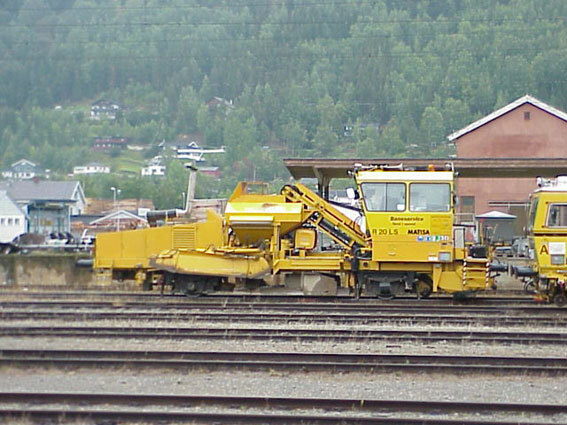 Todays rail roads use alot of high tech equipment to to detect any problems along the right of way. 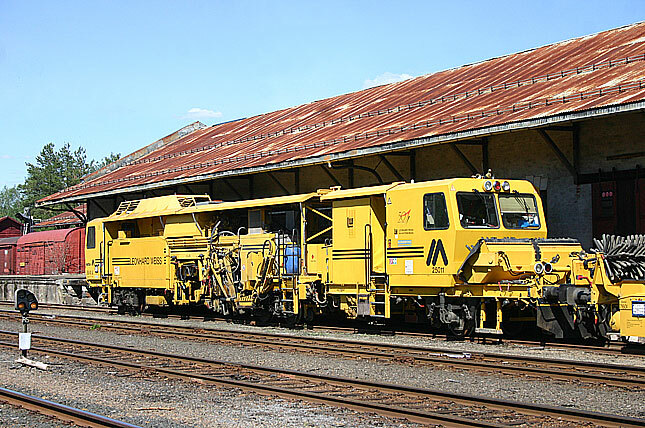 The higher speeds and heavier trains does take its toll on the railroads and to cope with that many uses various laboratory cars to find the source for problems before it will be a problem. 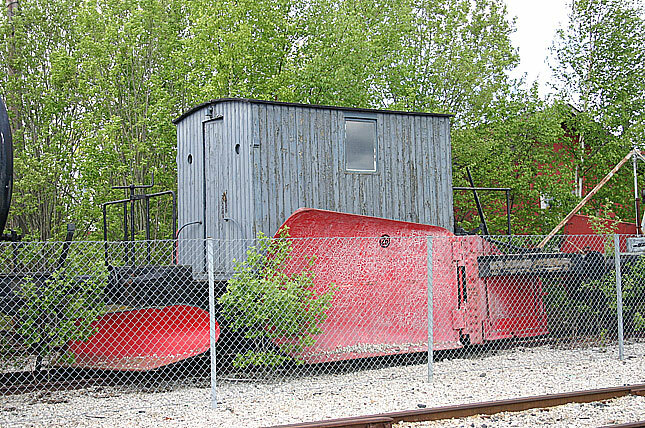 JBV uses as it seems a self propelled carof recent vintaage. 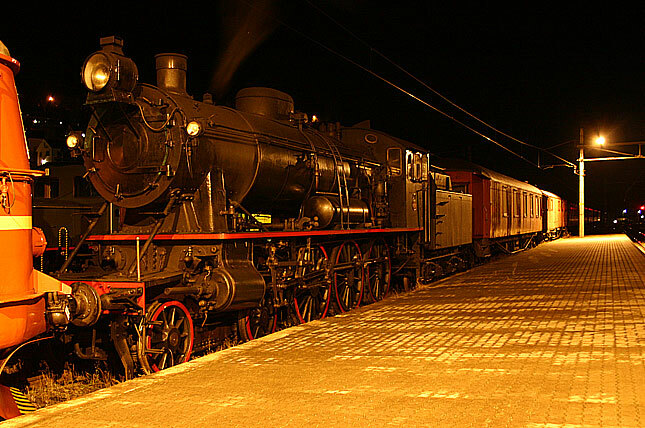 Today to detect problems and prevent accident has made railroading in to very high tech business. 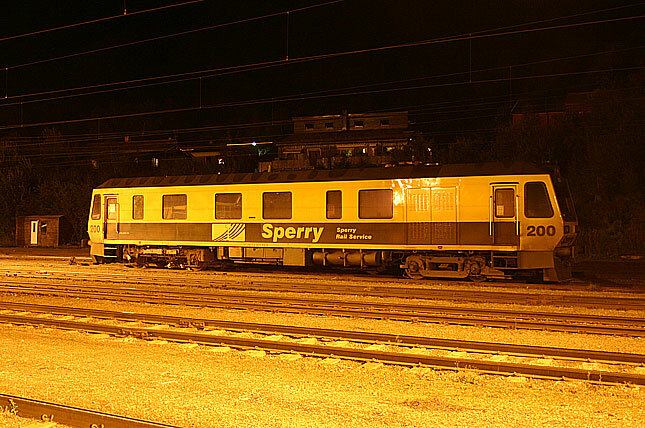 Ine of the companies word wide specialising to this is Sperry. Dombås 29th August 2006. 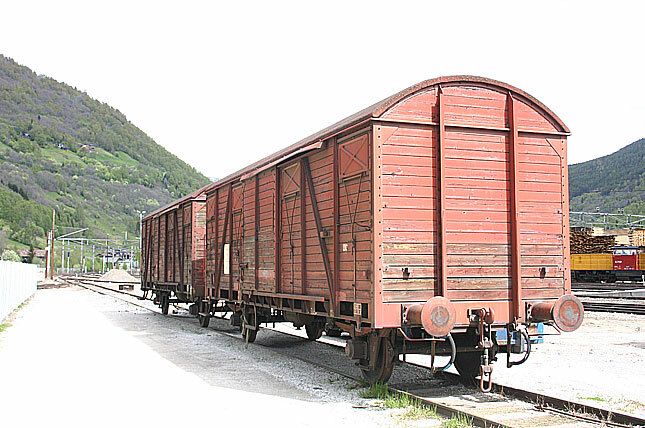 In the beginning the passanger cars did not have corridors and all the passangers were located in compartments. All these were connected to the world outside by doors. 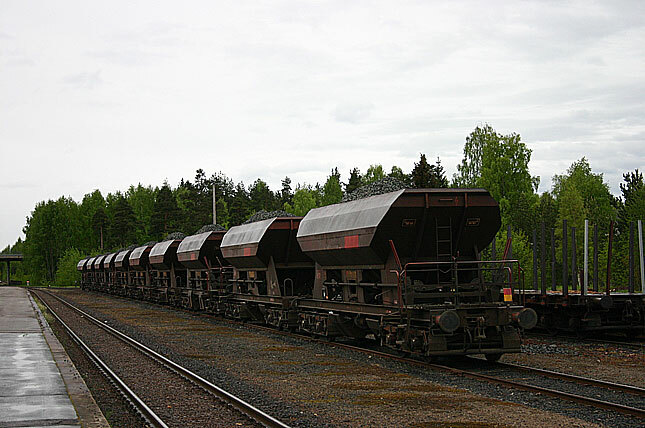 You can inmagine the angerous work of conductors in cold winter days on those slippert foot boards. 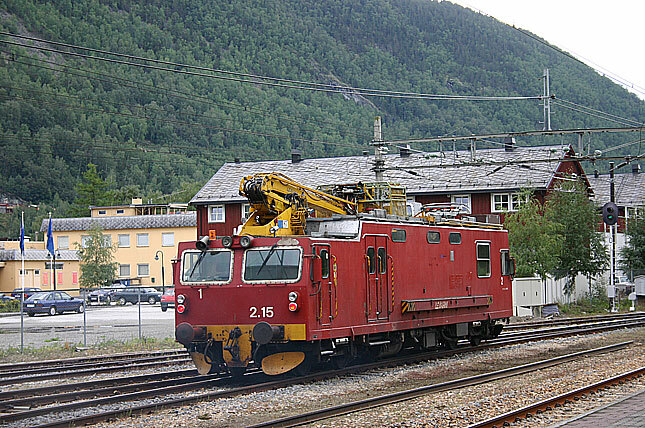 Otta 28th August 2006. 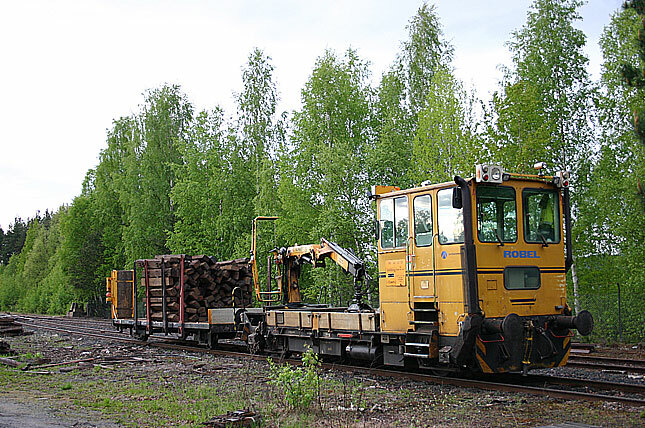 In late summer or very early fall, Jernbaneverket was busy to make their job on the Dovre line and the yard of of Otta was filled with various of MoV equipment. Your guess is just as good as mine. I guess it is a small bllast regulator or a tie replacing machine. Some of the MoW equiment are small enough to be "cute". 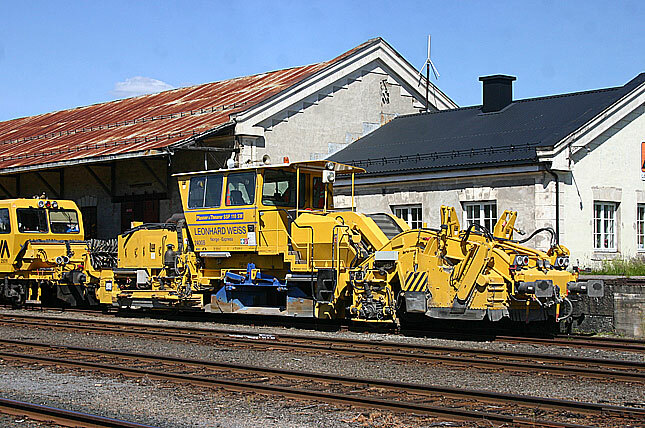 While at it, a couple of more modern, well not the latest MoW equipment from Norway, both shots from Otta. 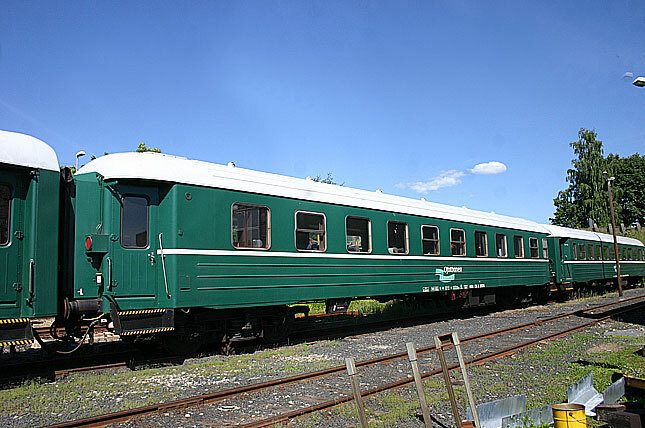 While we are at it with MoW stuff how about some classic looking lodging of the crew? 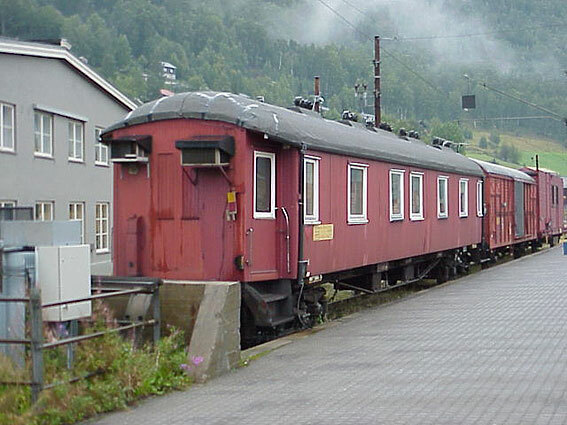 This car seem to be an ex sleeping car that is sitting in Åndalsnes in 7th of June 2005. 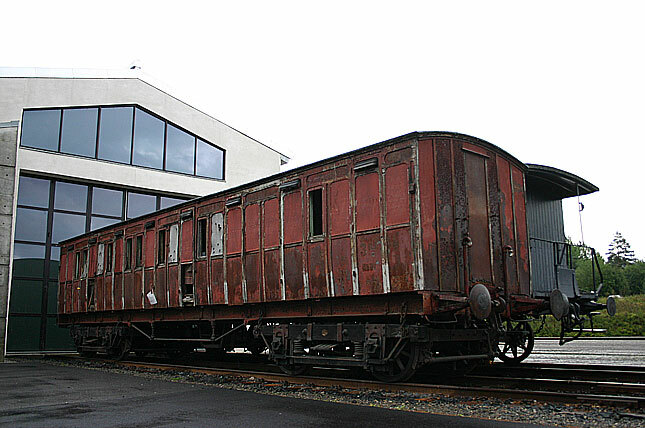 I guess that this car is a preserved car for future project for a preserved line or a museum. 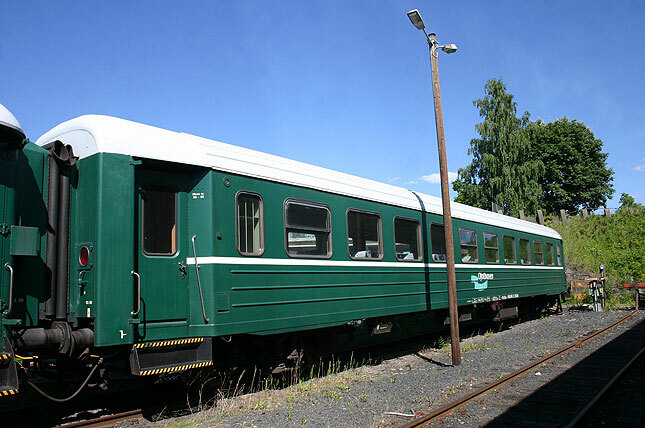 Originally this car was part of the first steel passenger cars in Norway and within time it has seen few modifications as the B3-type enterence doors before it was fully converted to a dorm car for the MoW crews. The passage at the ends are blanked and on this side a great spot to add an A/C unit for the extra confort while the other side houses a satelite dish to give the crews some extra channels for the TV on board. 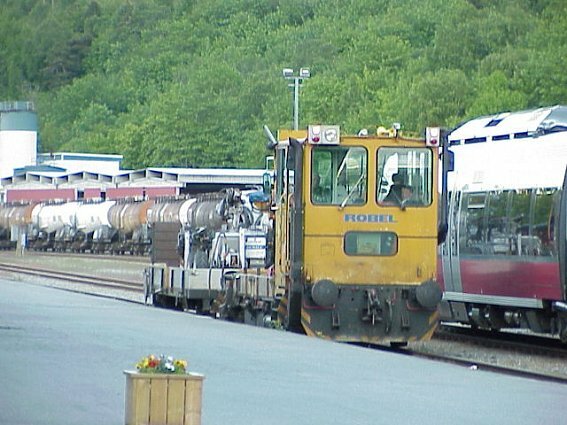 Elverum 2/6 2006. 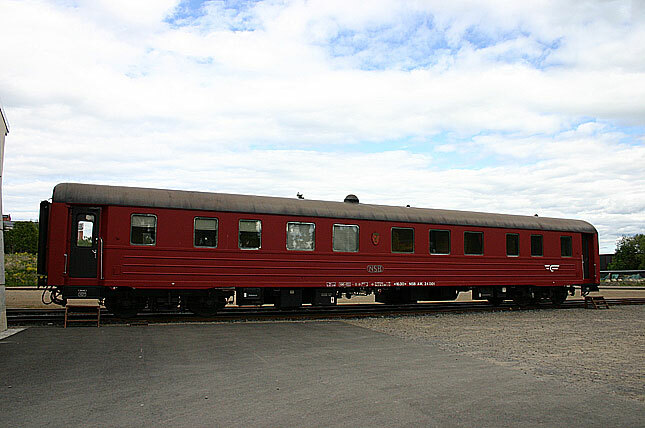 At the railroad museum of Hamar one of the star attractions is the former royal private car. Here the two side views of this car. I guess a bit more confortable than the crew cars for the MoW duties. 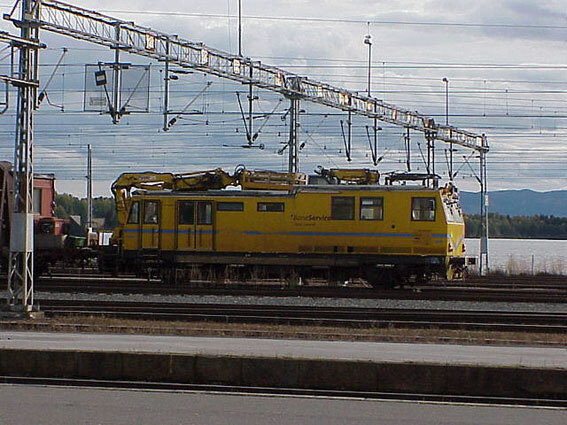 Hamar 9th June 2005. 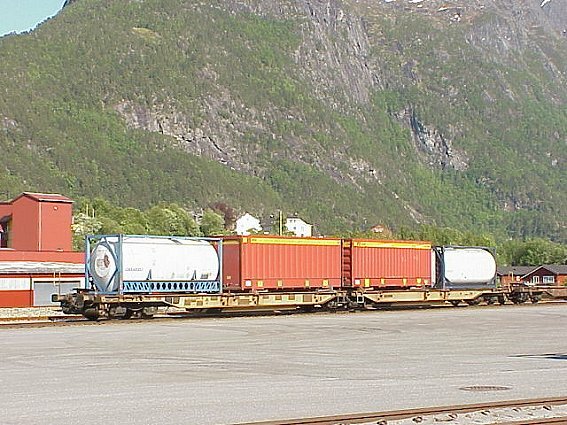 JBV is having G3 in Dombås for storage. 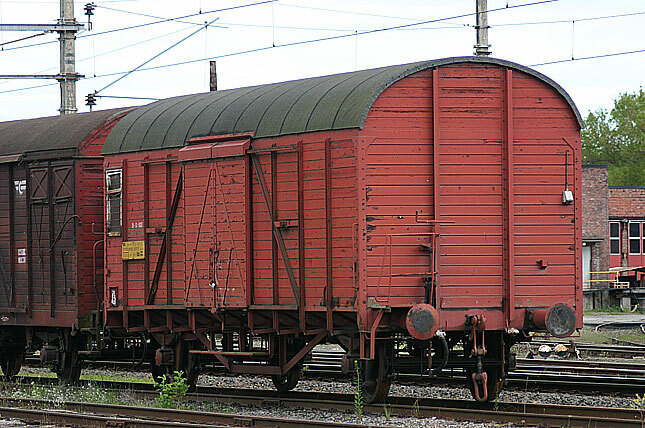 Date 7th of June 2005. Gs waiting for the torch in Elverum. Date 9th of June 2005. 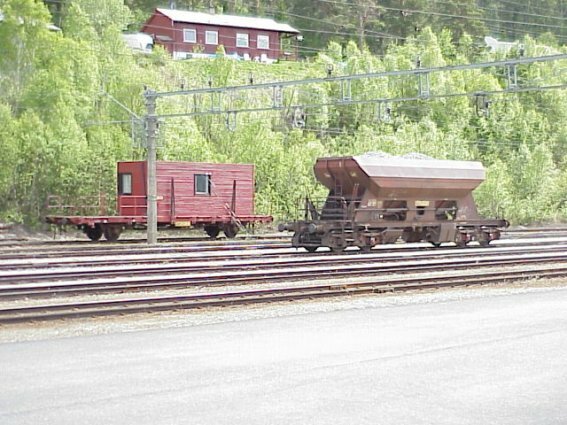 Over the years I have spotted these three cars parked on a siding north of Otta but never photographed them as either I had not enough film or as with the older digital camera I used not enough light. 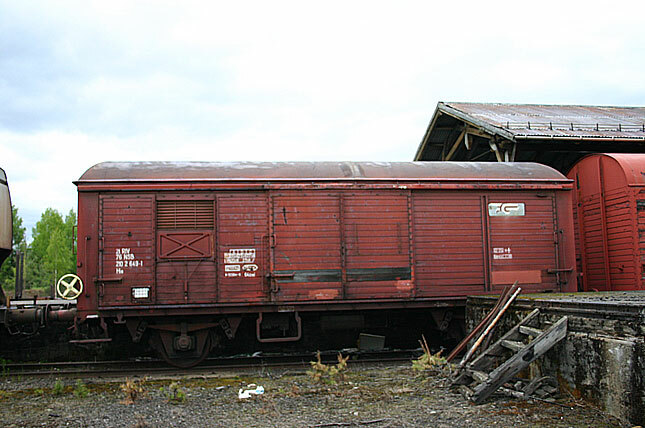 But in 2006 the cars were reparked close to the round house and more easily accessable. 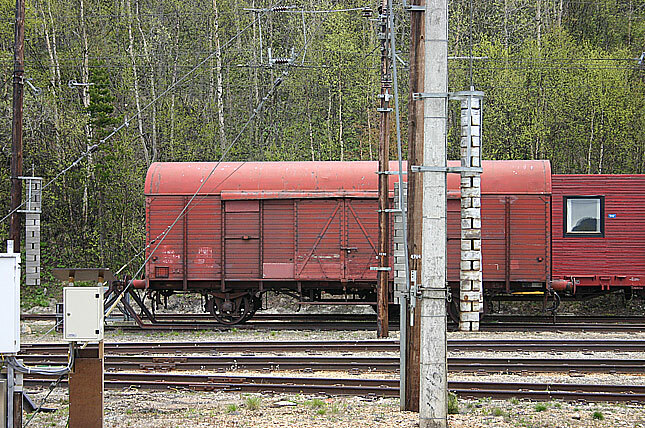 Back some ten years ago, I would never think off adding photos of plain box cars on this site but these once more than common cars have become very scarce. 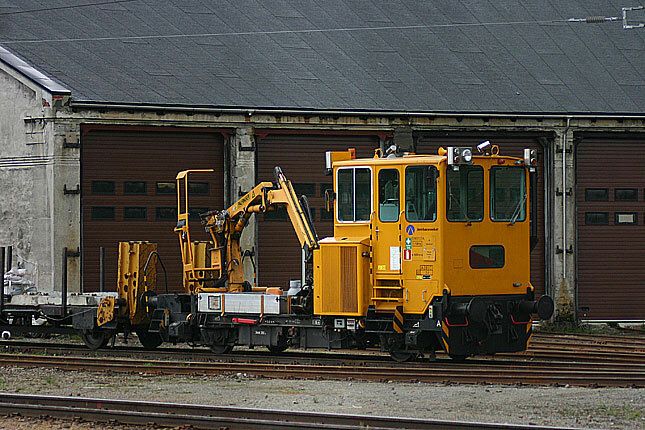 To find three of them very much unmodified for MOW duty is a treat. 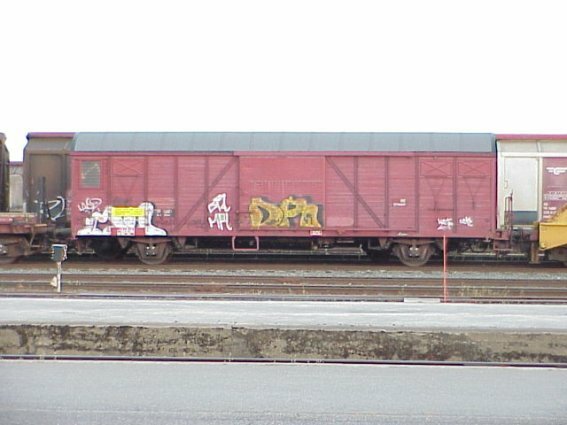 Otta 31/5 2006. 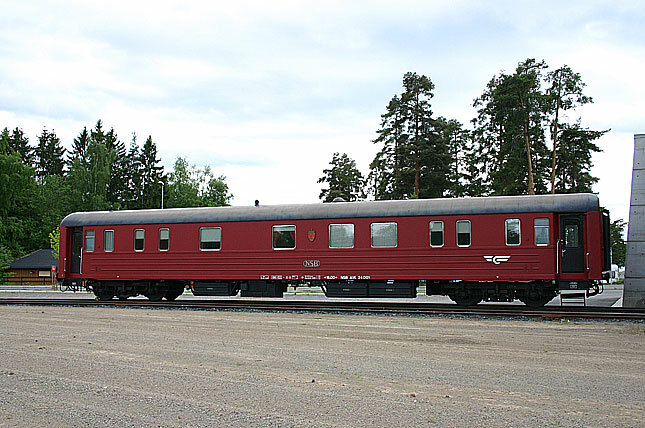 I guess that this car is now a property of the rail museum in Hamar but still waits before given attention in a rather good shape at the yard of Hamar. Note how much smaller these period cars look like compared to modern cars. I guess these cars are a forerunners to the modern all door cars seen everywhere. 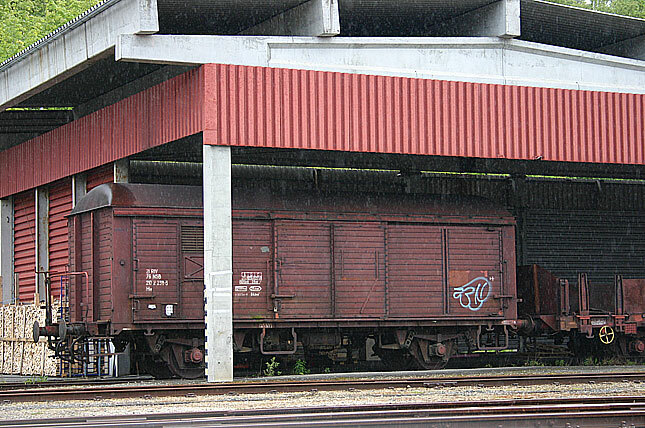 Sized as UIC Gs generation cars from the fifties they were often seen in express freight duties in even passenger cars. 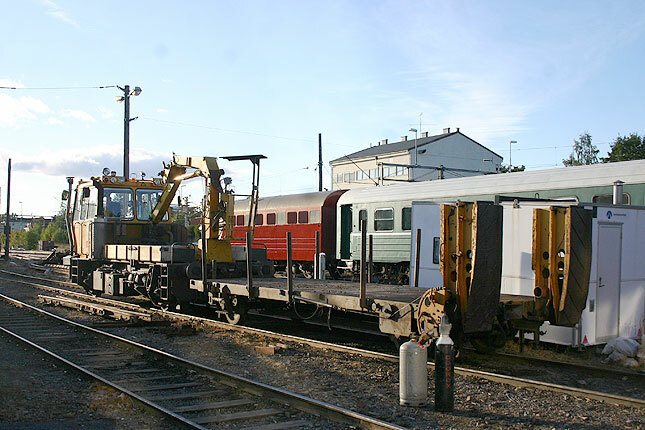 Now both cars are not used for anything else than for sheds on wheels. 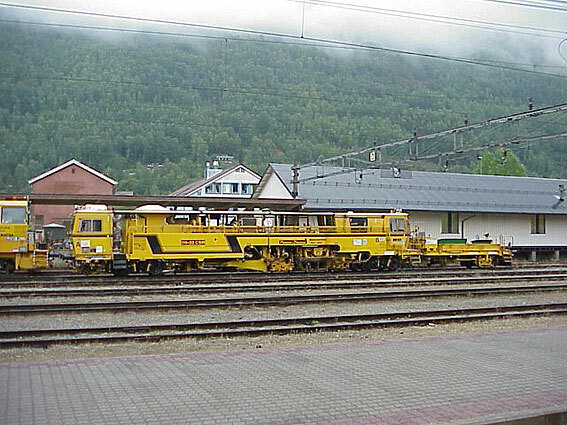 The Hs 202239 is seen in Åndalsnes in 31/5 2006 and the Hs 202649 in Elverum 2/6 2006. 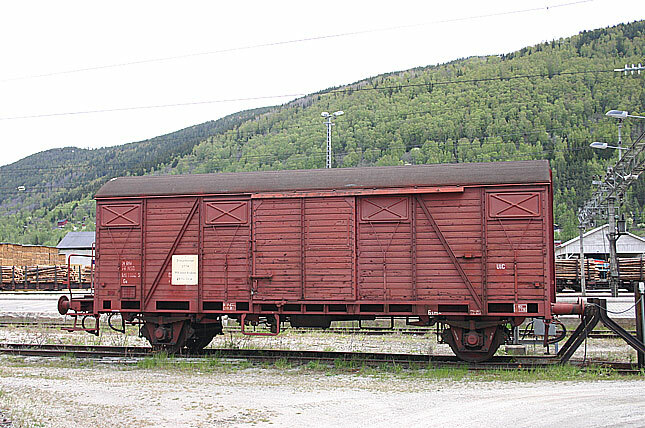 JBV still sees use of older ex German cars for storage such as this car in the shop area in Hamar. Date 9th of June 2005. 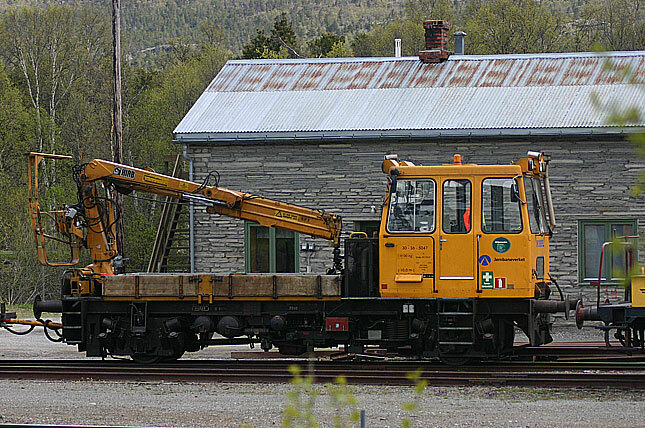 Older equipment are often modified to suit to the demands, like this ex DRG. 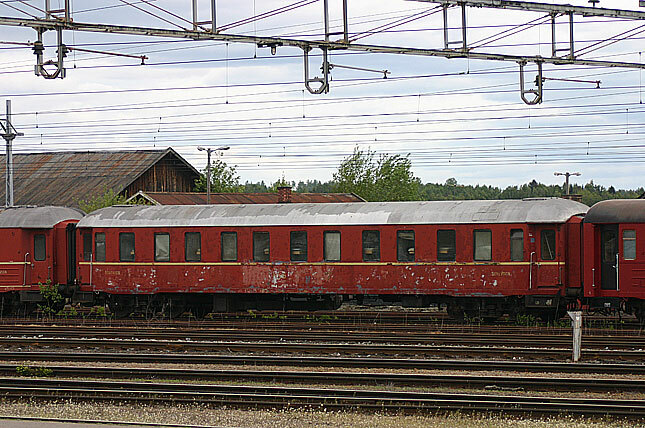 Dresden car that have some new windows added, but now slowly been robbed on parts and being scrapped at Elverum in 2002. 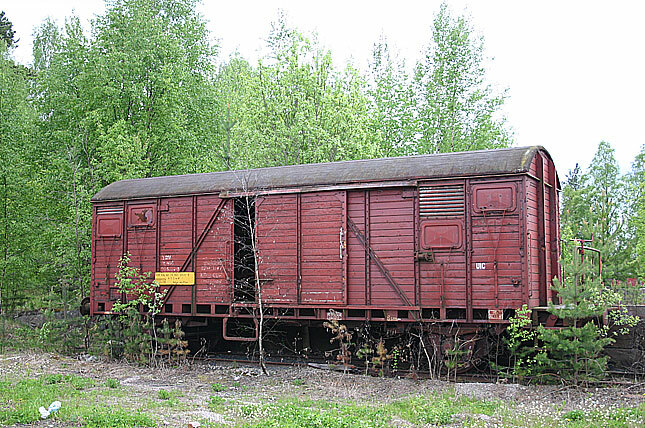 It was fast, how the once the in large numbers, those mysterious looking box cars are history. 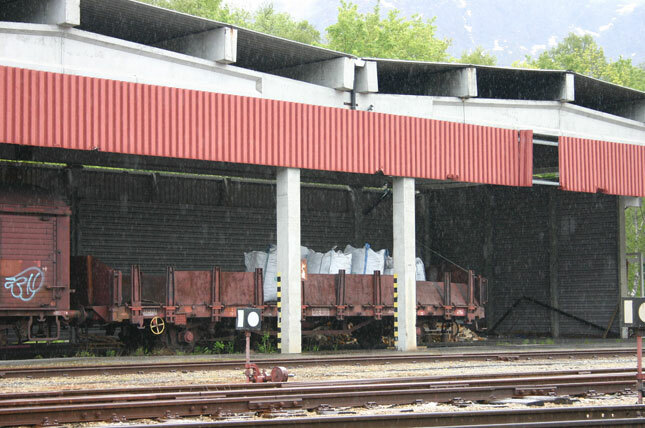 Those who are not recycled in to new products, most of them serves as rolling storage sheds more or less or waiting for the day someone regonize them for rail preservation rail road or groups. 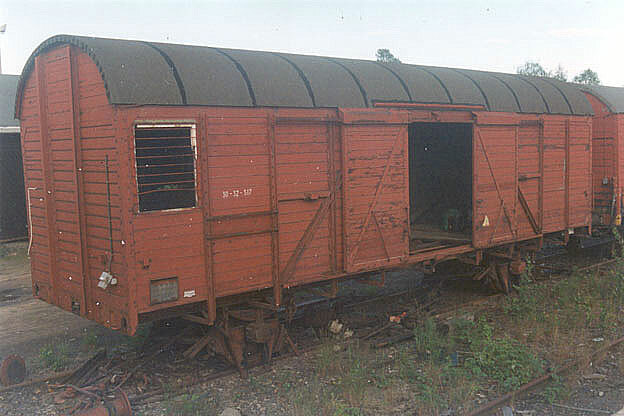 Here actually we have one box car, the others are early version of all door cars, bumbed away by new improved designs. 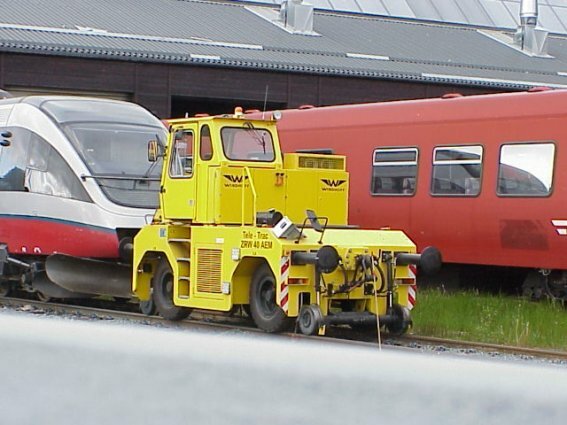 As the cars in GM-gruppen ownership looks a lot like as their hey days, Jernbaneverket, national agency does not hesitate to modify the cars to their purposes. 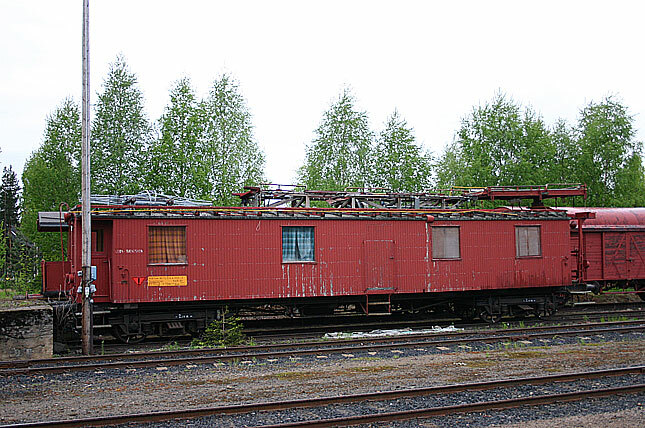 Once perhaps a pride of the freight car equipment now this interesting car seem to be forgotten at scrap yard of Elverum. Date 9th of June 2005. It is rather interesting to see modifications added to ex. 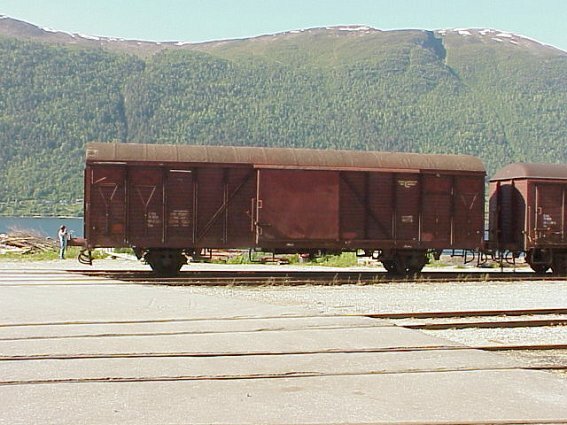 regular freight cars as they are adopted to MoW service, as the stake falt car in the background. 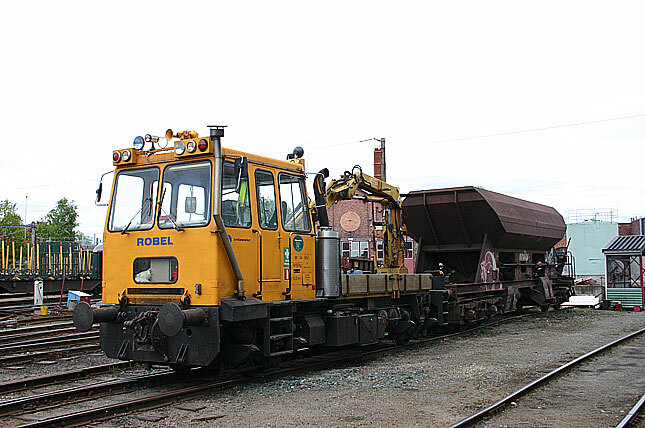 The gravel hopper however is from start custom built for this service. 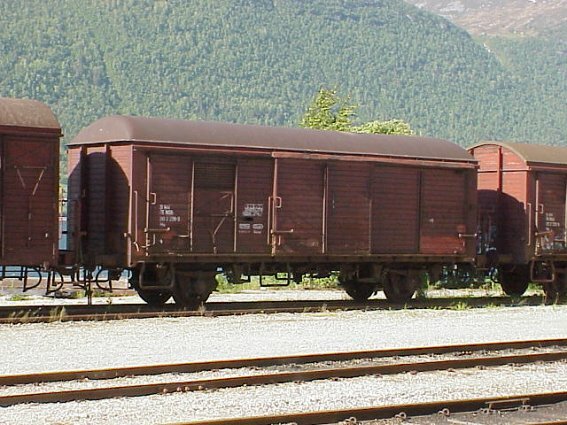 Once everywhere, even more common than box cars these condola cars with removeable sides to form either a flat car or a stake car are as scarce as box cars. Still 10 years ago you would find them every where. 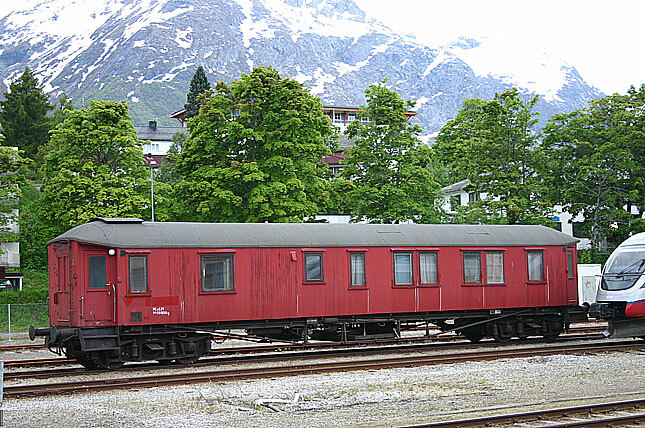 This car was found in Åndalsnes and spent its time as storage. 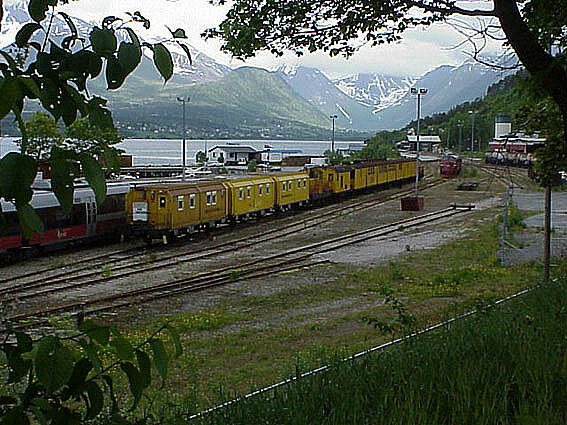 1/6 2006 Åndalsnes. 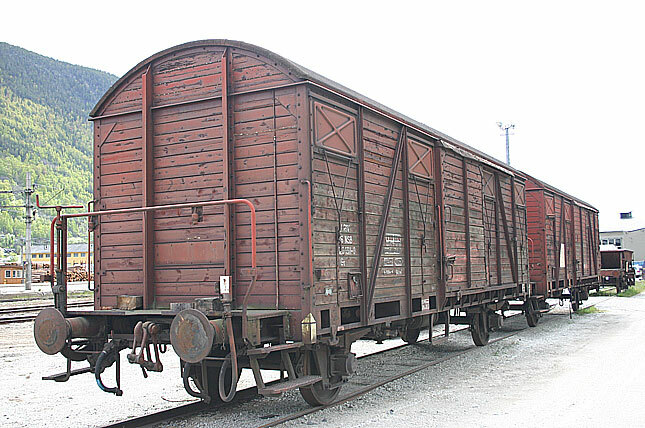 It is amaizing to see how freight cars and even MoW cars have developed. 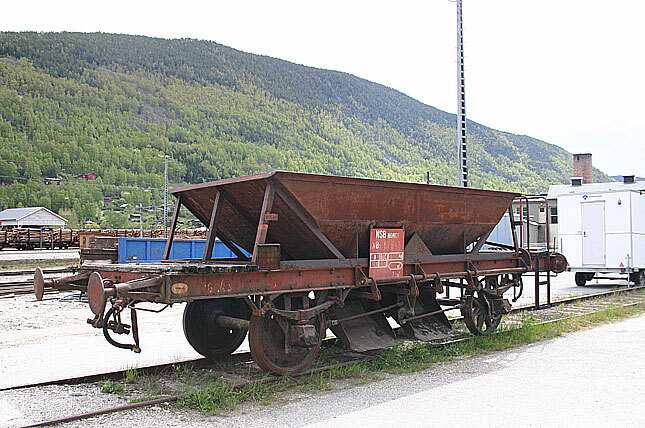 This car looks a lot like a wheel barrow on flanged wheels but was common for hauling gravel and ballast. 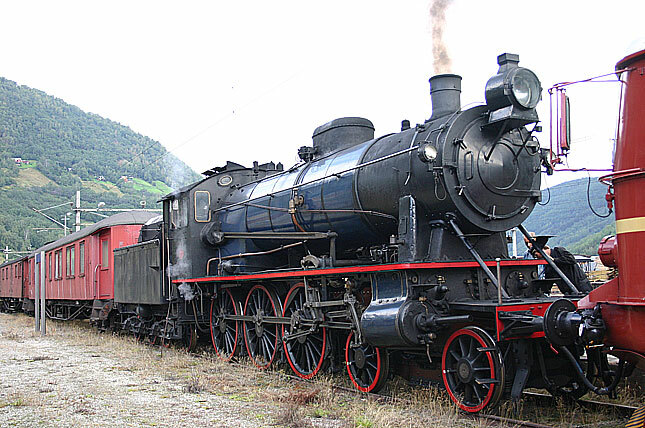 Looking a lot more flimiser than the massive 4 axled cars used today, they did see a long time in active duty. 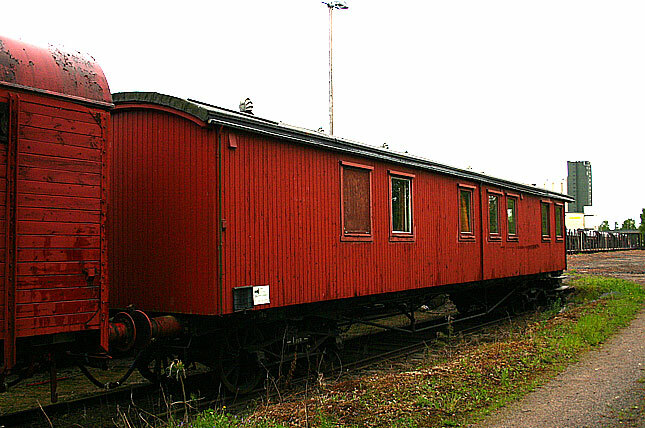 Now this venerable car is waiting for to be renovated by an active croup of enthusiasts housed in the round house in Otta. 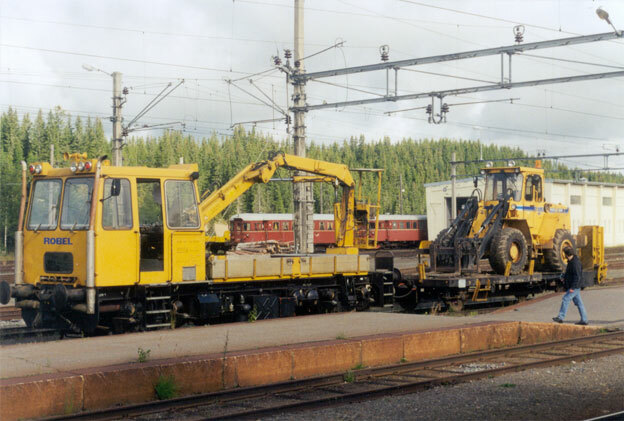 Photo in Otta 31/5 2006. 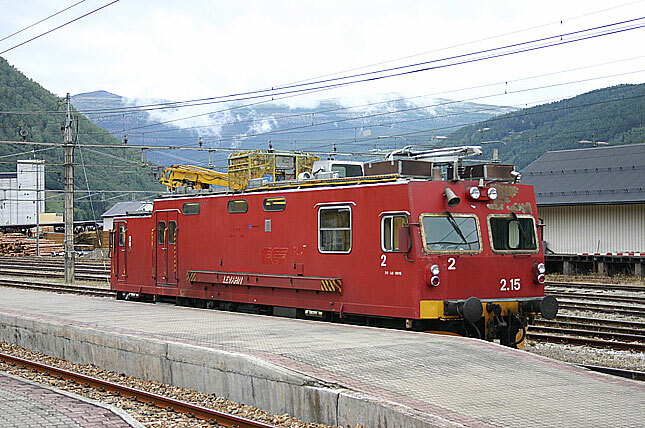 A trend among railroads is not to own their equipment, so firms and short lines like AAE owns perhaps a 1000 fold cars to handle their on line service, but the car leasing business seems to make money and the Swiss very short line is a major car leaser in Europe. Modellers note, that this is a car available in 1/87 scale model by Roco. 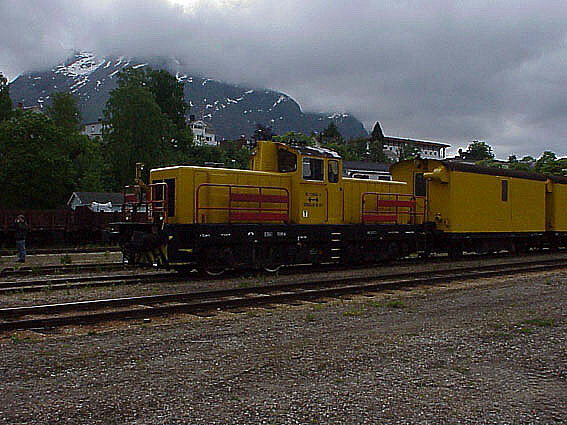 The visit to Åndalsnes in may 2003, ofered few suprices, such as restored Di3 and this Spino grinding train.